In 1939, the newly established Penguin Books published six guides to various English counties, complete with touring maps, aimed at the middle-class motorist. Emma Jane Kirby has been driving around the UK with those first-edition guides in her hand to see how Britain has changed since the start of World War Two. Next stop: Cornwall. The sea is throwing a tantrum today, smashing and fitting against the harbour wall and flinging a spiteful wind up the sands and inside the worn rubber seals of my window frame. I’m sitting drinking tea and eating clotted-cream Cornish shortbread biscuits in my Newquay hotel room, leafing through my 1939 Penguin guide to Cornwall and smiling at author J W Lambert’s often irritable tone. He seemed to feel his county was going rather off-kilter in the 1930s – and he certainly wasn’t a fan of Newquay. “Newquay is nothing but a holiday resort,” he writes. 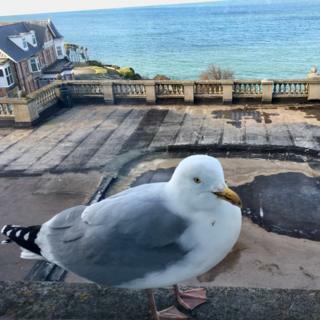 A fat seagull, puffed up against the wind sits on my windowsill and blinks at me reprovingly. I open the window a little and crumble some of my clotted cream shortbread for it. The bird peers briefly at the crumbs and then just looks up and stares at me. A mournful line from my guide pops into my head. “Cornish cream, like Punch, is not as good as it was…” – a reference to the Victorian-era satirical magazine that lingered on until 2002. 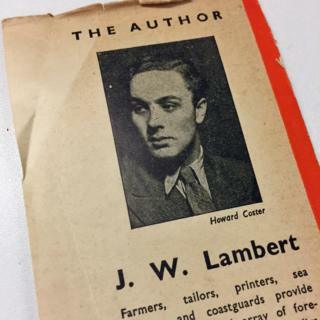 It might of course have been the impending war that coloured J W Lambert’s outlook, but he certainly appeared to feel that his beloved county had already seen its best by 1939. Take his pessimistic view on the fishing industry and the decline of that most Cornish of fish, the pilchard. Newquay fishmonger Gareth Horner shakes his head as he rakes the ice around two large crabs on his counter. I notice that almost all his produce has the black-and-white Cornish flag next to it, stating its provenance, but there’s not a single pilchard to be seen. 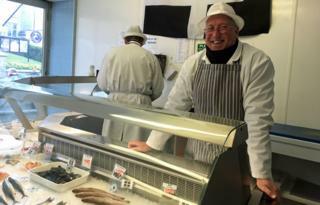 Horner, who’s the third fishmonger in his family, tells me that in J W Lambert’s day, after the decline of the mackerel trawlers, the local fishing industry did indeed take a tumble. But 80 years on, he assures me, fish stocks are recovering and there are plenty of day boats going out catching fish with hook and line off the Cornish coast. 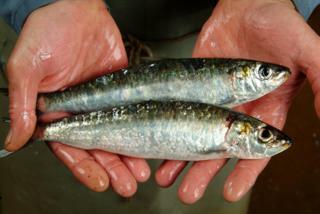 Cornwall is renowned today as an epicurean Mecca for gourmet fish lovers. In the 21st Century, I suggest, perhaps fish has replaced the eponymous pasty (something that can be “truly horrible”, our guide warns his readers) as the national dish? As I drive east towards the Rame Peninsula through a flurry of snow (my guide promising me a “warm and wet climate”) I feel sure J W Lambert would rejoice to see fish back at the heart of the Cornish identity. I’m not at all sure, though, that he would welcome the tourists that the Cornish brand attracts. Throughout the 1939 guide the author deplores the influx of holidaymakers and day trippers to his beloved county, as he felt they were spoiling its integrity. 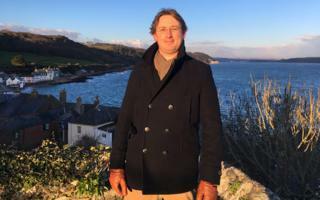 “Next, take the road to Kingsand, which, with its neighbour Cawsand, provides a splendid view of Plymouth Sound… The two villages are Plymothian playgrounds and not so pleasant as they were for the sightseeing visitor,” he writes. The wild sea has already thrown a small boat on to the sand at Cawsand and it is now battering the rocks, searching for more spoils. 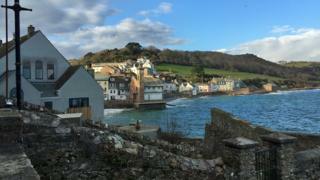 Despite the caustic wind, I’m enjoying walking round the idyllic village of Cawsand with its narrow, winding streets, its fairytale cottages and bijou beaches, all bathed in a magical wintry light. We amble together down the picturesque Garrett Street and with his gloved hand, he points to each front door. “That one’s a second home,” he tells me, “That one too. Next door is a holiday let, that one is a second home, the same for that one.” He counts them off on his fingers. “Of the 63 houses here, only 29% are occupied all year round; 36 are second homes and nine, the rest, are holiday lets. 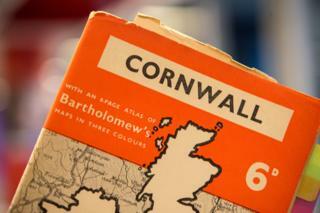 Cornwall thrives on tourism and always has, even back in the 1930s, but now we need to get the balance right. The rate of second-home ownership in the Rame peninsula is among the highest in England, with London buyers attracted by the relatively low prices as well as the beautiful seaside setting. Following the example of St Ives at the far end of the county, which has a similar problem, five parish councils on the peninsula have joined forces on a neighbourhood plan that insists all newly built homes are sold only as principal residences. Trubody unlocks a padlock that secures the door to a small building site. He tells me this is where an old haunt of Nelson’s – the 16th Century Old Ship Inn -stood before a fire burned it down in 2013. The council plans to restore the bar as a sort of heritage museum but upstairs, there will be five or six apartments built for young families on affordable rents. 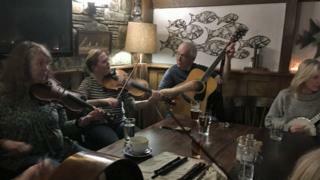 I come off the road to defrost at Seiners pub in Perranporth, home of the Cornish saint St Piran, lured by the promise of some Cornish folk music. I decide I won’t tell the musicians what our 1939 guide made of their town. The jam session is in full swing as I enter and I am surprised to see so many young people among the players. In 1939, J W Lambert, who wrote extensively about Cornish customs and observances, was already concerned they were “dying out”. “They’re bigger than ever!” retorts Merv Davey, who, as the Great Bard of Cornwall, the man charged with upholding his county’s traditions, is rather well-placed to know. We meet at Nanstallon Primary school near Bodmin, where Davey and his energetic wife, Alison, are teaching the children traditional dances for a big celebration on St Piran’s Day. The boys and girls are wildly enthusiastic about the skipping – and Davey’s banjo playing – and are quite ecstatic when he teaches them how to shout “Cool!” in Cornish. I can feel our 1939 guide doing his best to temper this passion. Admittedly, Davey can’t order a packet of cigarettes in Cornish (he’s a non-smoker), but happily, he can order beer. He tells me that in the 1930s there was a kick back against “alternative cultures” and that separate identities and Celtic languages were feared – seen as anti-establishment and in conflict with the British Imperial image. 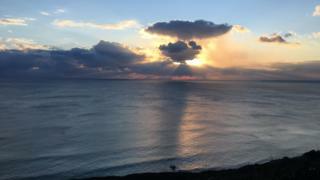 From the hill above Polzeath, the Rev Steven Wild and I stare incredulously at a barefoot young man in a wet suit, his surfboard tucked under his arm, who is heading resolutely seawards. The temperature gauge on my car dashboard informs us it is currently 1C (34F). “Now that’s dedication!” laughs the minister catching at his broad-rimmed black hat before the wind thieves it. Surfing, the Cornish passion, was a nascent sport in 1939 and if our guide knew about it, he clearly didn’t think it would catch on long enough to warrant a mention. But he was convinced about the staying power of Methodism in Cornwall. “Methodism first took hold when the sheep were unusually lost and hungry and did a great deal of good. It still has a strong influence,” he writes. Although congregation numbers have significantly dropped across the UK over the past 80 years, Cornwall is bucking the trend in one respect. Here a higher number of people attend church than say they are members of it, when asked by pollsters. 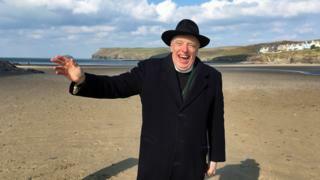 But it’s taken quite a reformation to get there according to Steven Wild, who is the chairman of Cornwall’s Methodists. “We’re trying to reach people in our culture where they are now and not saying you’ve got to fit into our shape,” he says. “Come and have a look at Tubestation and you’ll see what I mean,” he laughs. Tubestation is the Surfers’ Chapel at Polzeath, which during the week operates as a cafe. 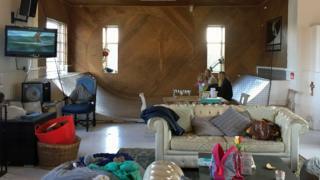 Mothers and toddlers’ groups use the space as a gathering place, the hymn board displays the wifi code and startlingly, underneath the wooden cross on the back wall where the altar should be there’s a skateboard ramp. Ten years ago, this chapel had a paltry congregation of eight people, today on feast days such as Easter, it can boast 300 to 500 people, many of them young surfers. The minister declines, on this occasion, to don a helmet and perform a kick flip (he is wearing a long black coat and dog collar) but he is absolutely adamant that the Church and its ministers must move with the times. I’m still laughing as I listen back to his interview that afternoon, while the plumped-up seagull sulks and shudders on my windowsill. I’m beginning to wonder if it isn’t the spirit of J W Lambert himself. I flick through the list of my recordings for something the gull might appreciate a little more than a surfing Methodist, hover mischievously over the BBC local radio station’s broadcast of the news in Cornish, before settling on a charming rendition of the Cornish folk song, Sweet Nightingale, which I’d recorded at the pub in Perranporth. My 1939 guide was unusually complimentary about Cornish singing. The seagull perks up a little after the first few bars of song and I try it again with a few pieces of clotted-cream shortbread. After a few moments of hard staring through the glass, it acquiesces and begins to peck half-heartedly at the biscuit. Tomorrow, if fishmonger Gareth Horner has any, I might treat the seagull to a pilchard.